The Adidas Originals Superstar features 20 special editions. This shoe comes in four distinct ranges; the Men’s Adidas Superstar, Women’s Adidas Superstar, Kid’s Adidas Superstar, and the Adidas trainers. It is a Cultural Icon. All the popular people are rocking shoes. If you are into pop culture and fashion trends, then these shoes are a must-have for you. What’s more is that it is a classic that never goes out of style. Popular trendsetters like super-model Gigi Hadid to pop artists like Chris Brown are known to rock these shoes every now and again. It has 20 Special Editions. There’s something for everyone when it comes to the Adidas Originals Superstar. The fact that it has a kid’s collection is a further advantage of this shoe range as it cuts across all ages. Comfort. This shoe is extremely comfortable. It comes in a low-cut structure that gives more comfort around the ankle. It also features a traditional lace-up closure that allows for an adjustable fit for more comfort. Its overall structure is meant to provide enough hold and support since it is a basketball shoe. It is Stylish. This shoe has a polished and refined look. 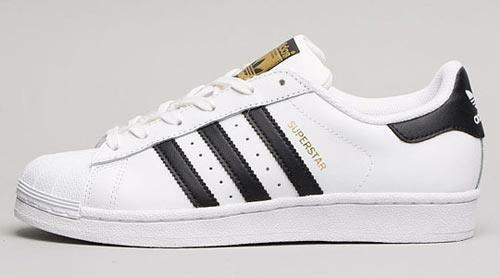 Many users have reported getting several compliments when they wear the Adidas Originals Superstar. These shoes encompass the feet in a flattering and subtle manner. It can be used as trainers as well as a fashion statement. Affordable. The Adidas Originals Superstar is very affordable if you compare it to other top-range shoes like Nike. It is very Minimalistic. The shoe has one distinct feature, and that is the three stripes on each side of the shoe. It primarily comes in white with the stripes available in different colors. The fact that it is minimalistic makes it go with any outfit. There have been complaints that this shoe runs about a full size or half size bigger thereby giving a wrong fit. When purchasing this shoe, you might want to take this into consideration. Some buyers have had a problem with the stiffness of this shoe. Loosening the shoelaces a bit, however, sorts this problem. The latest Adidas Originals Superstar that is being released into the market have received criticism when it comes to their durability with people saying that they are of poorer quality than the initial ones. This shoe is available for men and women, adults and children and it is offered in half sizes. 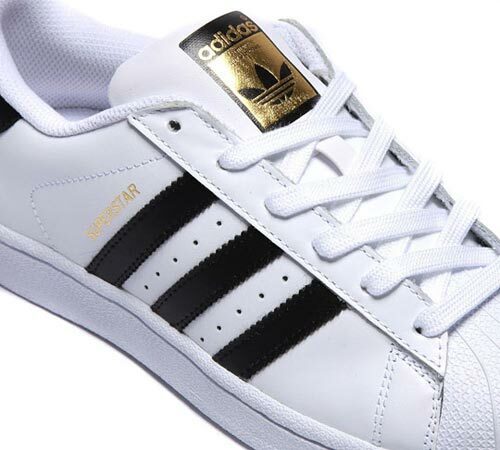 The men’s Superstar comes from size 4 to 20 while women’s sizes range from 5 to 11 US sizes. In terms of width, the men’s has a D- Medium width while the women’s Superstar comes in a B- Medium width. What stands out for the outsole is the trefoil logo that is visible on the tongue of the shoe and on the heel patch. The outsole of this shoe is synthetic. 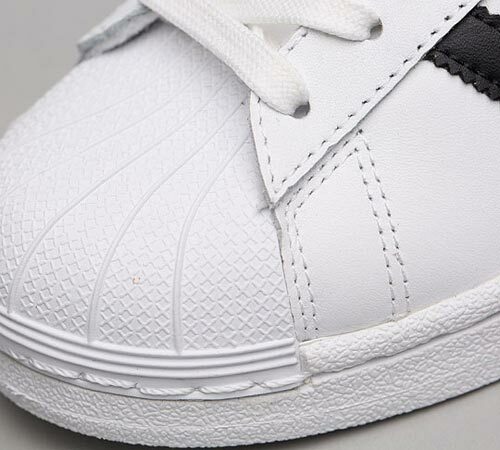 The midsole of the Adidas Originals Superstar has evident stitching details. The upper features a full grain leather with textile lining for great comfort and a soft cushion-like feel. This shoe has the right amount of stability. It may appear bulky but it also encompasses the foot giving it a snug fit. Even though the Adidas Originals Superstar is durable, compared to the previous designs, the durability aspect has declined. It is specially designed for maximum breathability. It has enhanced traction as it has been designed for basketball players. 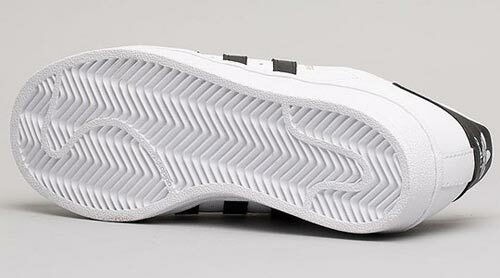 The traction and grip are improved by the rubber cupsole which follows a herringbone pattern. This shoe never goes out of style and over time it has become more of a fashion statement than a sports shoe. Regardless of why you need the shoe, the Adidas Originals Superstar looks good on anyone and goes with all outfits. The Adidas Originals Superstar needs no introduction or marketing. These classic kicks have been worn by popular icons. You have definitely seen these shoes across all media platforms and chances are you will continue seeing them because, as we have already established, the Adidas Originals Superstar are a classic that is here to stay. If anything, it will only get better. This shoe is a common feature on both sports channels and fashion columns. For a shoe with all this fuss. One thing is for sure, you can never go wrong with a pair of Adidas Originals Superstar.